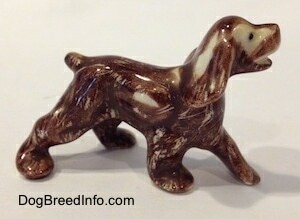 Aside from the Goebel dog figurines, another one of my favorites are those made by Hagen-Renaker, Inc. I think what attracts me to them is the way they are life-like in their appearance and their size. The ones I like to collect are just tiny little things, which means they do not take up a lot of space, leaving you room to collect more of them! I remember collecting them as a kid and they are still around today. A lot of the dogs and other miniature animals would, and still do, come on a card. The instructions say to soak the card in water to remove it. I remember buying these little dogs and excitedly going home to soak the card to get it off of the figurine. Removing the card does not lessen the value of the figurine. The only thing the card does is verify it is an original Hagen to an amateur collector. Some of the cards also contain the dates the piece was made and/or the list price, which is sometimes interesting when looking at the vintage pieces. The Hagen-Renaker company was founded in Culver City, California in 1945. It all started in the garage inside the home of Maxine and John Renaker. John Renaker had set up their first kiln by hooking up a garden hose from the family gas stove to the kiln in the garage. Maxine worked in sales and was the company’s first designer. Starting a company in one’s garage is difficult these days considering all of the permits and licenses one must now obtain. Those were the good old days for mom and pop businesses. The couple made hand-painted dishes that were signed HR Calif.
Maxine's dad, who everyone called Ole Hagen was a carpenter and with the help of his brother Arne, built John and Maxine their first building, along with an apartment to work out of. The company was named Hagen-Renaker in honor of all of their help. In 1946 they moved their company to the new building in Quonset Hut in Monrovia, California. They began making butter pats, plates and shadow boxes. Two years later they started producing miniature animal figurines that quickly became very popular. It came about when Maxine had made a small duck. She was a Camp Fire Girls leader and made it for the kids. John decided to add it to the order sheet and to his pleasure it sold and there started the lines of many different animal figurines. A lot of people like to collect the horses. I personally like the dogs. In 1952 they came out with a Designers Workshop line (DW) of larger animal figurines, run by Bill Nicely and Nell Bortells, which are highly collectable to this day. This line was later re-named the Pedigree line, which started in 2005. This line is a bit larger than the minis. The minis are my favorite. From 1955 to1960 they made over 100 different Disney figurines, miniature size and larger. All of the Hagen pieces are hand painted so they do vary in their looks. The size of their animal figurines would also vary slightly. As a mold was used over and over again the pieces it produced would grow in size. A single mold will last for about 25 pieces before it was replaced, as the details would become less apparent. The U.S. pottery business came into troubled times in the late 1950s to early 1960s. Even with all of Hagens’ new lines the company was struggling. They had come out with the Arizona Flagstone pieces, which were brightly decorated with primitive animals similar to cave drawings, the Little Horribles, Black Bisque animals and Zany Zoo pieces. Yet with all of these new pieces they could not compete with the Japanese market. They even tried cutting costs by using Aurasperse paint, which does not have to be fired in a kiln. However this strategy did not last long as the paint washed off and scratched easily. The company was forced to close down for a while but was able to open back up in 1966 in San Dimas, California. In the 1980s they made large Designers Workshop pieces, Freeman McFarlin pieces, Specialty lines and Stoneware. Sadly Maxine Renaker passed away at the age of 89 on July 17, 2003. John Renaker decided to retire leaving the company to their daughter, Susan Nikas. It is still up and running in San Dimas, CA, USA. Their animal lines remain their most popular. They currently make a lot of specialty dog lines, which is what I like to collect, although I think all of their animals are fantastic. They currently are the only manufacturer of miniature ceramic animals left in the United States.